According to preliminary figures for March 2019, the value of exported goods amounted to ISK 49,600 million fob and the value of imported goods amounted to ISK 62,900 million fob. 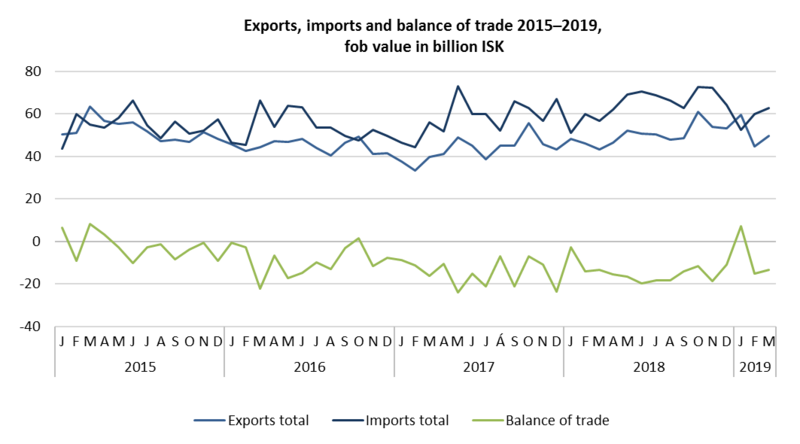 Thus, there was a trade deficit, calculated on fob value, of ISK 13,200 million as compared with a trade deficit of ISK 13,500 million in March 2018, at current rates of exchange. Excluding trade in ships and aircrafts the trade deficit was ISK 13,300 million in March 2019 compared with a deficit of ISK 12,900 million in March 2018. In March 2019 the value of exported goods was ISK 6,400 million higher than in March 2018 or 14.8% at current exchange rate. The increase was mainly due to exports in marine products. The value of imported goods in March 2019 was ISK 6,100 million higher than in the same month last year or 10.7% at current exchange rate. Mainly due to an increase in capital goods imports.